The question put to me most often after I accepted the position at the University of North Carolina Charlotte was “Is this the end of your involvement in El Sistema?” I was sorry but not surprised that my colleagues felt compelled to ask. University faculty have a (generally) undeserved reputation for being out of touch, as focusing entirely on data and research rather than the human dimensions of the work. The stereotype of the university professor might well be an amalgam of Antoine de Saint-Exupéry’s Businessman and Geographer: unjustified self-importance combined with a general cluelessness. In this analogy, Sistema would of course be the Little Prince, full of blithe questions, magic and wonder. Separate planets not just desirable, but required. When I took the post at UNC Charlotte, I was very conscious of this particular dichotomy. I had to remain true to my values, and I wished to deepen my involvement and my impact in social action through music through my new platform, not lessen it. As I have to remind people often, I’m a performer, not an academic, and my terminal degree is the D.Mus, not the PhD. And so I perform. (Okay, sometimes I write too.) I may not be the Little Prince, but I have pretensions of being the Pilot, attempting to repair the aircraft. 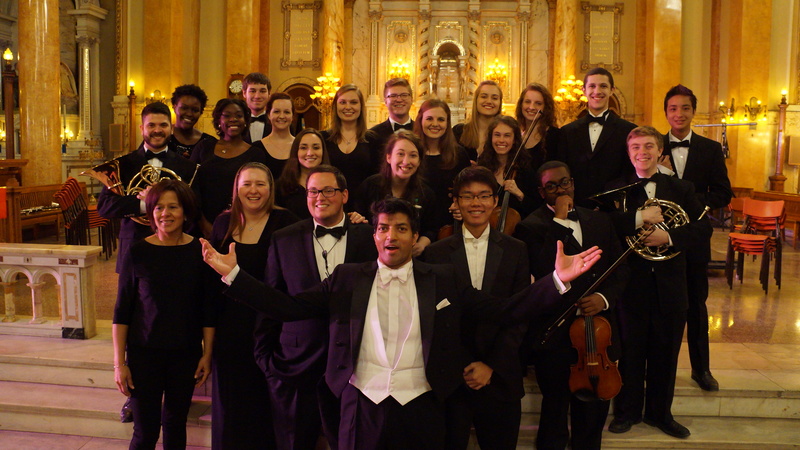 In the three and half semesters I’ve spent at UNC Charlotte I’ve done my utmost to reorient the Orchestras program to reflect both my values and my ambitions in Social Action through Music. This started with the actual practice in the rehearsal room: the great paradox with which we are faced is the orchestra as a vehicle for great potential social change, versus the orchestra as the most anti-social mode of cultural expression. It’s a paradox that cannot be ignored, try as the sector might, nor is it one to be enjoyed or explored for the purposes of philosophical pontification: it sits like a cancer on the heart of everything we do. This unhappy divide between theory and practice, fuel for Baker’s fire, has long been justified to the public through the use of maxims or aphorisms that in reality only reinforce how mismatched the traditional practice of the medium is to the purported mission. And so in my work, to avoid this blatant hypocrisy, I try – try – to demonstrate a different practice that gives voice and autonomy to musicians within the framework that is thrust upon us by our context. It puzzles, bemuses and befuddles those musicians conditioned to being utterly micromanaged by a conductor, but I also believe it produces far superior musical results in the end. But I look to a practice beyond the rehearsal room or concert hall as well. We’ve done outreach performances, performances specifically for children and families, and worked with several of the Sistema programs in the state. But it wasn’t enough: constraints of time and budget and other academic obligations meant that our involvement was perpetually tokenistic, dropping in and then disappearing, not to be seen again for at least another year, just like our professional counterparts. The only solution was to take academic obligations and time off the table as much as possible. So we went to Montréal Canada for a week between March 22nd and March 29th, to embed ourselves with the Viva!Sistema programs in the region, to integrate ourselves with an inner-city Arts Magnet school, to immerse ourselves in service through music. This wasn’t a vanity tour, in which college orchestras play to empty houses as an excuse for tourism. 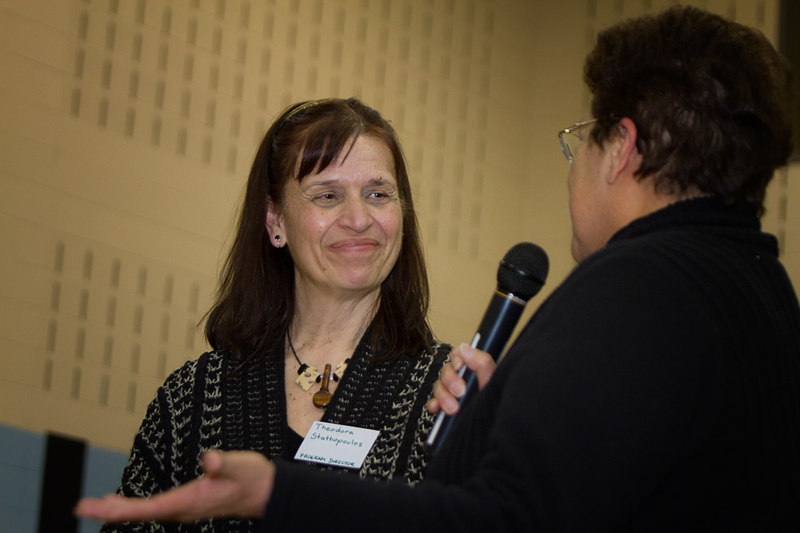 This was a service residency, and we came to serve, thanks to the support of the FACE School, the FACE Foundation, the QMEA, and Theodora Stathopoulos,undoubtedly one of the most influential people in Sistema in the circles that actually matter – even if she’d never describe herself that way. (More to her credit.) With the support of our Québec partners and UNC Charlotte, we were able to offer this trip to students in the orchestra at next to no cost, again with the intention of being consistent with the values of social action through music. For many of the students, this was the very first time they had left the United States, and for one in particular it would mark the first time he would ever fly in an aircraft. The week ended with two performances of a fairly ambitious program: a suite from Bizet’s Carmen, Sarasate’s Navarra, Danzon No. 2 by Márquez, Huapango by Moncayo, Malambo by Ginastera, among others. 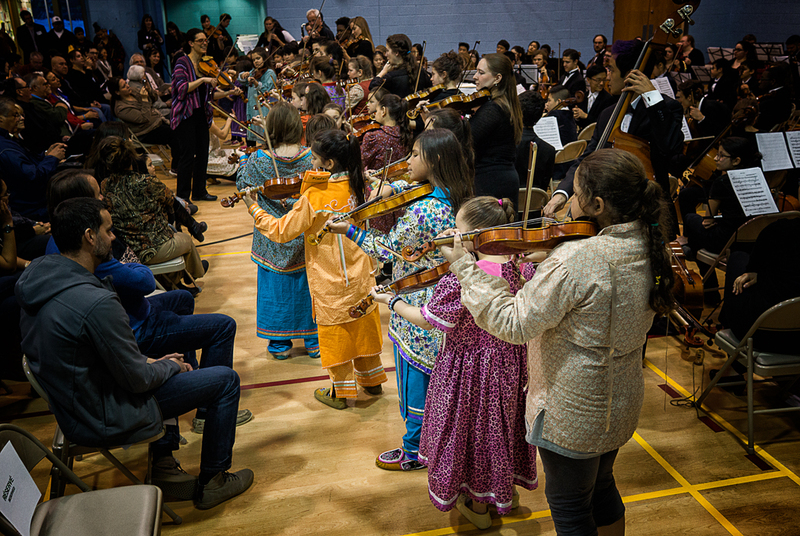 One concert was presented on the Mohawk First Nations reservation of Kahnawake, perhaps the first time a full 110 piece symphony orchestra had ever performed there, and the other in the Pt. St. Charles neighbourhood, both venues also home to Viva!Sistema programs. At both events students from the nascent programs were featured and ultimately combined with the large orchestra – at one point in St. Charles, 144 performers were assembled. No glorified concerts halls, no Maison Symphonique. This was for people who might never get to the great temples of arts, who wouldn’t feel at home there even if they went. Following the residency, I took time to speak with my students to hear their thoughts on what they had accomplished in Montréal. One consistent theme emerged. Although they enjoyed the performances immensely, it was the connections that they had forged through the experience that mattered the most to them. They wanted to connect and they had: to their new Canadian friends, to each other, and in some cases, even to me, their despised professor, through the pressure cooker environment of the week. And I had connected with some of them too. My first responsibility in my position is to my students and their education. I wanted them to be transformed by this experience, and I believe strongly that they were – and that through their transformation they transformed others as well, and that they may for the first time in their lives appreciate the power of music to be life-changing on the most personal, experiential of levels. The ideals and values of Sistema – not the Venezuelan version, but just the idea that music can be a powerful agent of social change – are alive and well at UNC Charlotte. Perhaps the Prince and the Businessman can’t co-exist, but the Prince and the Lamplighter might. Lamps were lit. A week isn’t much, but it’s what we could do given our constraints, and we did it. Congratulations Jonathan… so the transformers are transformed. I think in this, music is the quantum foam of social learning, action and change. It really is pretty damn fine to see things come together like it did for you all, in Canada. So well done you for putting it all together! Thanks so much, Chris – I can’t actually express how rewarding this service residency was on so many levels for so many people, including me. I’m not too old or to jaded to be transformed myself.